Vegetables at the supermarket tend to be predictable. There may be 10 varieties of apples, but there’s usually only one or 2 varieties of everything else. I’m told this is because the varieties that are sold can be produced quickly and with less resources. Also, since they are the type that the average consumer is accustomed to buying, the growers try to meet that demand. One thing you won’t notice is what’s missing from those picture perfect rows of veggies: the rejects! After having a garden for a few years, I’ve noticed that my produce sometimes looks quite different from the produce at the grocery stores. Some varieties will never let you down: squash, beans, tomatoes, peas, lettuce and pumpkin. These are tried and true and are rarely picky about the soil I grow them in. Others, however, are a little… delicate. I still haven’t managed to grow a watermelon that isn’t yellow on the inside (a deficiency in magnesium I think…). My cucumbers last year didn’t even produce. But what continues to make me scratch my head is carrots. At the store, every carrot is 12 inches long, about 1.5 inches wide and bright orange, even at the top. They are invariably straight. So I was greatly surprised by what I pulled out the ground the first time I grew carrots. I found the fattest carrot top I could see popping out of the dirt. I gave it a yank, just like I’d seen in a cartoon as a kid (and probably last week), and instead of a carrot, all that came up was the green top; the carrot was stuck in the ground! Unless the dirt is pretty moist, they don’t come up easily. So I grabbed a spade and loosened the dirt. I was thinking that this carrot would be huge! It must be longer than a foot! But what came up was a 3 inch long, 1.5 inch wide carrot. Needless to say, I felt let down. Thankfully, I don’t garden to feed my family (yet!). Today, I decided to ferment some carrots (something I haven’t done before and will write about in another post soon! ), so I went out to the garden and dug up some carrots. I was mystified by what I found. One carrot looked like something from the game, Plants vs. Zombies, but I’m not sure what side it would be on. As you can see in the picture, it had about 6 tap roots. The other carrot that surprised me came with a partner. As I looked at it, I was in awe. These two definitely didn’t want to let go of each other. 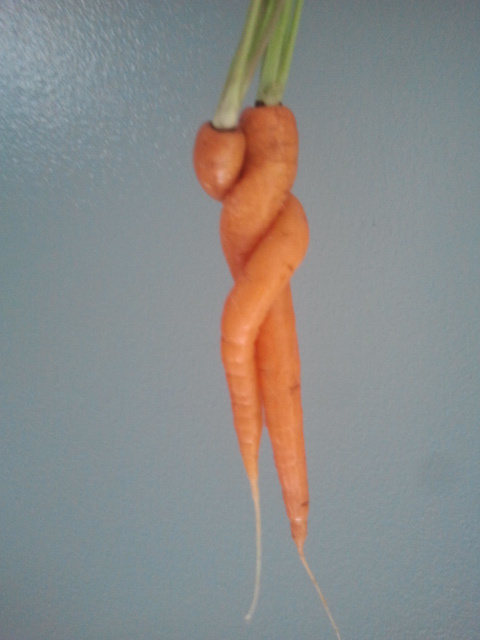 Makes me wonder if even vegetables can fall in love. Life is a lot like carrots for me. Most days are plain and ordinary like the market-bought carrots. They lack that satisfying crunch that comes from trying something new. 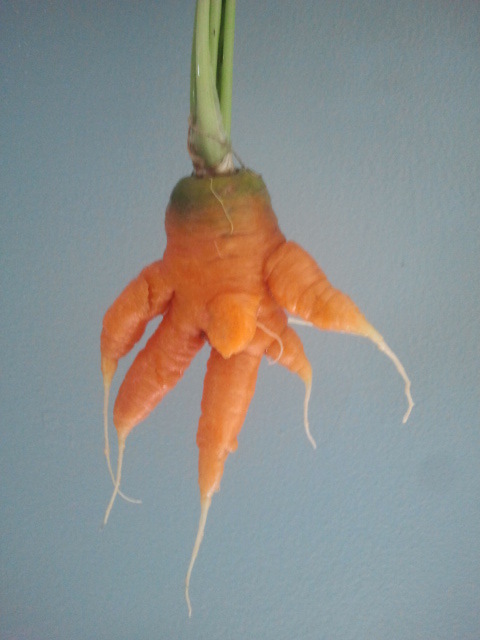 Some days, life is scary, like my mutated carrot. It can be overwhelming and make we question why I’ve chosen to go to Thailand or seek adventure of any kind. That’s when I’d rather just give up and take the life that was given to me in the first place. But then, there’s the days of wonder. They don’t come along very often. If you’re not paying attention, they’ll pass you by. These are the days when you find your bearings once again, vision is restored and strength is renewed. Life is given purpose once again, and you remember why Life is Good. Previous Post Best Birthday Ever!